An outback green tree frog has almost made a full recovery, after being air-lifted from Mount Isa to Cairns in Australia following a lawn mowing accident. 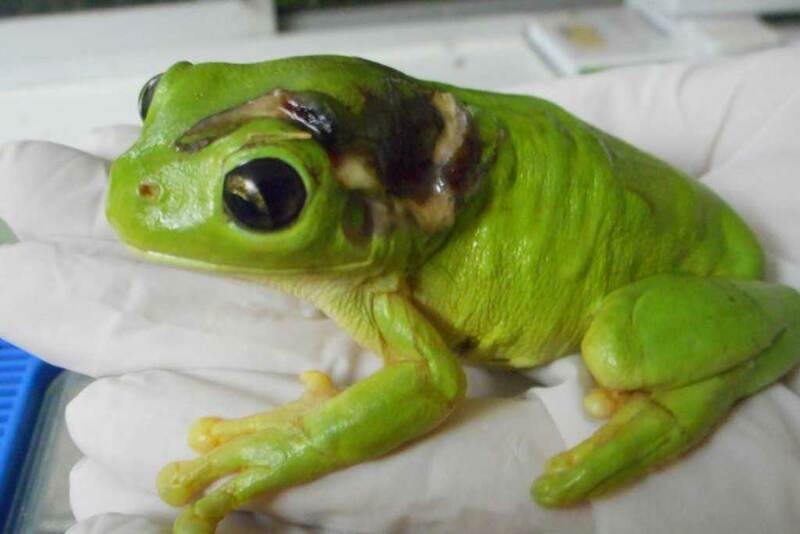 Deborah Pergolotti, president of the Cairns Frog Hospital, said a Mount Isa woman accidently mowed over the amphibian, which resulted in a large gash on its back. Ms Pergolotti said after the accident, the woman reached out to her family who helped her get in contact with the frog hospital located in Queensland's north. "The only thing that we could do to help this lady in Mount Isa was to get the frog to Cairns," she said. "That started a big bureaucratic process of finding out which airlines now had the contract to service Mount Isa and Cairns, contacting them, and then they had to contact their animal handling people." Ms Pergolotti said while the flight was kindly donated from an airline carrier, other parts of the frog's journey were not as easy. "The frog even had to go through airport security, it had to be x-rayed," she said. "It was an unbelievable process of getting out here to Cairns." Ms Pergolotti said it was clear that the animal was already in distress. "The person who found the frog had accidently ran over it with their lawn mower, which means the frog was out during the daylight hours in the middle of the day, indicating that it was unwell," she said. And Ms Pergolotti said by the time the frog arrived in Cairns, its condition continued to deteriorate with the wound getting infected. "He had a lot of different, alternate treatments to make sure that we would minimise any possible bacterial involvement, and get rid of the bacteria that was already there," she said. "It was a lot of intensive attention, special baths every day." Despite the traumatic accident, Ms Pergolotti said the frog was on the road to recovery. "The wound has healed," she said. "One eye has been permanently affected by the injury but otherwise he catches his food well, and he's picked up weight. He's done an incredible job and he's a very lucky animal to have survived an accident of that type - usually there's not much left when they get run over by something like that." While airlifting a frog from Mount Isa to Cairns may seem like a big effort for a little animal, Ms Pergolotti said it was not the first time air transportation has been organised. "We've had them fly in from Gladstone, Bamaga, Weipa, Cooktown - we even had a few come down from the Torres Strait," she said. "We are pretty much 'it' when it comes to frog rescue and rehab for the northern half of the state, at least." 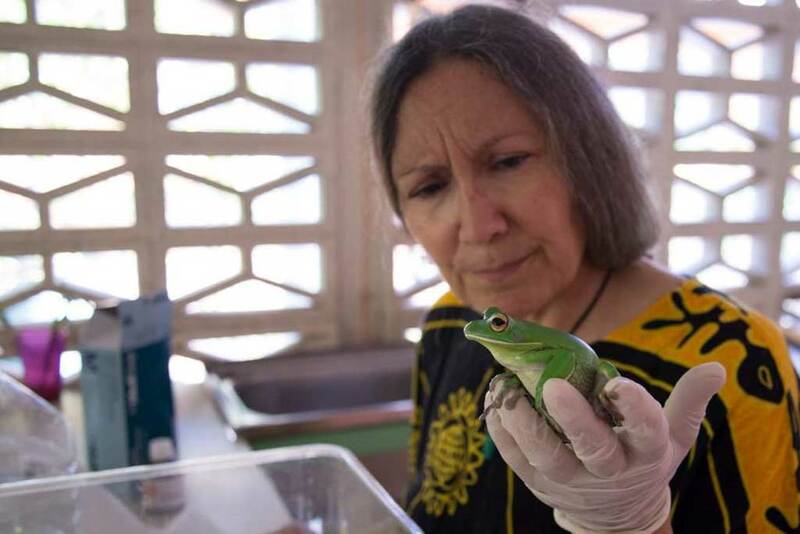 Ms Pergolotti said while the hospital nursed frogs from across the state, many people did not realise the vital role it played in their protection. "Most of the public still doesn't realise that frogs are not necessarily included in your typical wildlife rescue repertoire," she said. "It's still one of the animals that have not really made it above that line - there's almost a glass ceiling. People will bring a baby bird to somebody if they find one, but that sort of mentality hasn't quite translated over to frogs very well, yet." Mount Isa's frog is scheduled to return home sometime next week.